Wilson (Egyptology, U. of Durham, UK) has written an accessible but detailed overview of Egyptian hieroglyphs. The origins of hieroglyphs, the role of writing in ancient Egypt, the power of words and names, the relation of the script to spoken language, the status and profession of scribes, and the history of the decipherment of Egyptian hieroglyphs are the main topics. "Hieroglyphs were an all-powerful force in communicating the messages of Ancient Egyptian culture for over three thousand years. Far more than a language, they were imbued with their own special magical symbolism and were used in tombs and ceremonies to communicate with the gods. They hold the key to unlocking many of the secrets of this fascinating civilization, and give us an intriguing insight into the minds of the ancient Egyptians - their beliefs, hopes, and dreams." 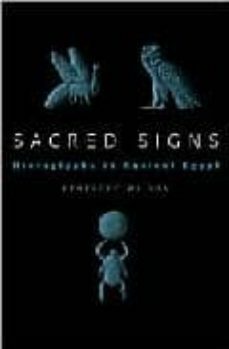 Uncovering previously neglected areas of this absorbing story, Penelope Wilson emphasizes the origins of the script, its continuing translation after the decipherment by Champollion, the use of cryptography, and the powerful fascination hieroglyphs still hold for us today.